This article is by Matthew Sorell, senior lecturer in the School of Electrical and Electronic Engineering at the University of Adelaide. It originally appeared on The Conversation. analysis Yesterday, the new Minister for Communications, Malcolm Turnbull, announced he had asked for the resignations of the National Broadband Network (NBN) board. He stamped his authority on the direction of the National Broadband Network through a letter detailing government expectations of NBN Co, and revealed the reconstituted board would have 60 days to review the rollout and cost of the network. Unlike the last three years of election campaigning, this was a calm, pragmatic, thoughtful and largely depoliticised presentation. This is very welcome, as it offers hope the NBN review will be evidence-based rather than a political witch hunt. Mr Turnbull made it clear he had asked for the board members’ resignations not because he had any particular disagreement, but to give the new government flexibility to appoint a board to meet its new agenda. In fact, he was at pains to recognise the achievements of the NBN board to date. He stipulated business as usual would continue where work is advanced and contracts are in place. For those of us lucky enough to live in places where the rollout is already happening, this is great news. Turnbull was at pains to point out that elsewhere, the review may very well demonstrate that fibre-to-the-premises (FTTP) is the best solution, and that his position on technology choice is “truly agnostic”. He mentioned very-high-bit-rate digital subscriber line (VDSL) could be deployed in edge locations where fixed wireless technology is currently being proposed and FTTP is not going to be offered. Malcolm Turnbull announces the NBN review. But there are some concerns. These really boil down to politicisation not of the technical side, but of interference with project management. Three red flags caught my attention: frequent reference to the NBN not meeting its targets, weekly reporting of progress, and the cost benefit analysis proposed as part of the 60-day review. Any large infrastructure project, whether building a telecommunications network, a road, or a navy ship, requires extensive management for the project to get delivered on time. It is immensely frustrating that NBN Co in its current form was pressured to provide a timeline of rollout by connections, and that this will continue. A real project does not work this way. The biggest factor causing the delay to connections was negotiating an arrangement for access with Telstra. The outcome is a faster and much cheaper rollout using existing ducts, but starting later. Meanwhile, priorities were shifted to other parts of the network, such as fixed wireless, satellites, and the transit network. Committing to a certain number of connections per week at this stage is nonsense, and reporting connections per week is a meaningless exercise in micromanagement. A cost benefit analysis is a worthwhile exercise, but only to some extent. Such analysis runs a high risk of being biased and, therefore, useless. The notion of “cheaper” and “faster” have not been defined. There are few precedents on which to base assumptions, and there is a high risk that the review will be skewed towards an outcome thought to be desirable to the minister, or to defend against the perceived desires of the Minister. It was refreshing to hear Mr Turnbull’s strong statement that he wishes to hear the facts, not spin. We will see what happens. What is meant by “cheaper”? The NBN is an infrastructure project with ongoing expenses. A cost benefit analysis is usually expressed in net present value, essentially a dollar amount at today’s prices. However, the way in which future value is discounted varies according to the nature of the project. It is not clear whether such a figure should include just the infrastructure or the ongoing maintenance and related operations, nor for how long we wish to consider the project. It is probably true that the use of VDSL over existing copper lines will be cheaper than FTTP over the next ten years. But fibre infrastructure has a 50-year lifetime. What is the net present value of the entire project over 30 or 50 years? There are further problems here because the value has to be measured against the contribution of the major shareholder, the government. Is the concern the total amount of money paid from Treasury? If so, the cost benefit analysis will need to quantify productivity and economic growth and the effect this has on taxation revenue. If the concern is peak funding, this has consequences for other government programs in the short term, but this is something the NBN Co can’t assess as part of its internal cost benefit analysis. My frank assessment is that we will probably see a lot more fibre being delivered than we were expecting under the new government. DSL technologies on copper will be exploited where these can deliver a better connection than existing arrangements, even if it means these customers wait longer for their inevitable fibre connection. While there are some concerns around political interference, overall I am encouraged by yesterday’s announcement. I have faith in his (Turnbull’s) proposals, but I don’t have faith in him, the man, to deliver them. I don’t have faith that he will abide for, or allow for a decision, that indicates that Labor were right in their primary technology choice, even if that decision makes it clear that it is possible to significantly improve things by changing some parameters, like for example the footprint size. He has been backing FTTN as a the primary technology base for too long. True agnosticism would be political suicide if true agnosticism turns out to not align with his “vision” he brought to the table in the form of his FTTN policy. On the same note, can Turnbull afford to back himself into a corner here and barrel down a path that will likely paint both himself and the liberal party as irresponsible idealogues? Many here can’t see how his current LBN model could be viable with open competition, so obviously something somewhere has to change. I am personally hoping the changes are sweeping and FTTH is back on the cards…… I guess I am feeling optimistic today. Technologies are tools. The tools we choose, and the way we use them, are not value-neutral – particularly when one is talking about policy. Policies express values and ideologies. The notion that ‘cheaper’ is not value-laden brushes aside the problem that ‘cheaper’ (however it is defined) *is* a value, and the way ‘cheapness’ is ‘calculated’ *is* a value-statement – in many senses of the word ‘value’. The claim that our Federal Executive Government is ‘agnostic’ towards technologies also deflects from the question of their chosen values regarding the context of decisions about technologies. What is ‘cheapest’ or what is the most ‘appropriate’ technology is dependant upon commercial decisions, and *those* are dependant on a whole suite of value-judgements. There are and will be many claims to ‘neutrality’ in decision-making in the years ahead. Unfortunately, what is believed to be ‘neutral’ is *itself* a value judgement. And the speed with which NBNCo has been transformed from *the* infrastructure delivery vehicle to just one of many – before any ‘cost-benefit’ analysis process is even agreed to – suggests a swift and comprehensive ideological shift will (and has) come before any ‘neutral’ decision can be made. The problem we have is the recent announcements from Turnbull sound very reasonable – in fact so much so it would have been nice for Labor to have made some of them. However we’re dealing with a person who demonstrated time and again over the last few years that he’s excellent bordering on extraordinary at appearing to present a well reasoned argument, that hides great errors of reasoning or that he just plain back-flips on. The better he sounds to you, the more you have to be on guard. I’d suggest that if people want to save FTTP that they should lobby hard for Simon Hackett to take a leading role. He is the only senior industry participant I’ve seen openly comment on flaws in Labor’s NBN and suggest viable solutions for fixing the issues. That… has to be the only sensible comment I have seen you make all day Mathew. I’m not to sure if Turnbull would be open to Simon Hackett, he has been openly hostile towards Turnbull’s plan just as much, if not more than, Labor’s. However, if we can make it happen it might bring some sensibility to the board. Technologies are tools. The tools we choose, and the way we use them, are not value-neutral; particularly when one is talking about policy-driven decisions. Policies express values and ideologies. The claim that our Federal Executive Government is ‘agnostic’ towards technologies also deflects from the question of their chosen values regarding the context of decisions about technologies. What is ‘cheapest’ or what is the most ‘appropriate’ technology is dependant upon commercially-oriented decisions; and *those* are dependant upon a whole suite of value judgements. There are, and will be, many claims to ‘neutrality’ in decision-making. Unfortunately, what is believed to be ‘neutral’ is *itself* a value judgement. And the speed with which NBNCo has been transformed from *the* infrastructure delivery vehicle to just one of many – before any ‘cost-benefit’ analysis process is even agreed to – suggests a swift and comprehensive ideological shift will (and has) occurred before any ‘neutral’ decision can be made. Public policy is not value-neutral, and neither are the tools used to implement them. To suggest that technologies are value neutral is to overlook the values behind their creation, their implementation, and their uses (including abuses, misuses, and repurposing). Computer and information technologies are not neutral, if for no other reason than that humans find being ‘neutral’ very difficult. Even if the technology choice is agnostic, it’s all pointless if the NBN process leaves us with a privately owned vertically integrated wholesale national monopoly yet again. Or for that matter the same holds for any number of privately owned vertically integrated wholesale localised monopolies. What we need is a national network where commercial imperatives do not impede the delivery of technological innovation to customers, as has been happening for nearly 20 years. The danger is not so much substandard broadband, although that’s bad enough, it’s an environment of entrenched substandard broadband in which commercial barriers are placed in the way of network upgrades. Has anyone forgotten the foot dragging by Telstra on ADSL as they tried to wring out the last dollar from ISDN? Or the 1.5Mbit limit, that existed for no known reason? Or the years of resistance by Telstra to third party DSLAMs in their exchanges, which finally led to the availability of ADSL2+? This is exactly the sort of environment that Turnbull’s “infrastructure competition” is designed to create. NBNCo as a monopoly provider would result in exactly the same result. What makes you think that NBNCo won’t drag their feet on expensive upgrades to GPONs wireless transmitters and satellites to ring the last dollar from the existing network? The only significant change we’ve seen in the last decade was triggered by Internode installing it’s own DSLAMs in Telstra exchanges and removing the speed caps. It took years for Telstra to respond to that. Because that would not be in the political interests of its shareholders. The shareholders are answerable to NBNCo’s customers at elections. Those shareholders would also have an interest in maximising the beneficial effect of the NBN on the economy, rather than on share price or dividend. Unlike private owners, NBNCo would have no incentive to under invest in their own network. However, if NBNCo was sold that would be a different question. It would just be a rerun of the Telstra privatisation. I would argue the reluctant move by Telstra from ISDN to ADSL was more significant, but that’s by the by. It took years for Telstra to respond to Internode, because it took years for Internode to install enough DSLAMs for Telstra to take note. Then almost overnight ADSL2+ became available across the country. A prime example of Telstra’s dire influence on Australian broadband. Would you agree that if Turnbull’s plan allows such influence to remain in private hands, that his policy would then be a failure? Well it’s the actually the opposite of what you describe if you care to read Coalition policy under the heading of ‘Infrastructure competition’, unfortunately the majority of those who criticise that policy don’t bother to read it and go off into fantasies of conjecture based ‘cherry picking’ theories. You mean, as opposed to those who read the Coalition’s policy as if it were ‘gospel’ and then exaggerate each and every word in their own inimitable way… in other words they do the complete opposite they have done for years? Why the hell are you still allowed to comment on here, Fibroid? Just about every time you write something you are in clear breach of the comments policy. You keep repeating the same nonsense as though fifty people haven’t already extensively demonstrated the tremendous flaws in your assertions. It’s like swatting an annoying fly that’s been zipping around your head for hours, mashing it’s tiny carcass into an unrecognisable smear before wiping it up and putting it into the bin, only to hear a familiar buzz in the air and the dreadful realisation descends that you have to repeat the same pointless tedium afresh. For the love of sanity, won’t someone please take his f#@&ing respawn button away?! Oh, please. The choice will be about as agnostic as the Pope is. Fool me once, shame on you, fool me twice, shame on me. Anyone who believes in Turnbull’s platitudes is just plain gullible and should be ashamed of themselves. We don’t care at all what technology we use. We are totally agnostic. The question we will be asking: What is the cheapest and fastest way to get people a minimum of 25Mbps? The questions we won’t be asking: What will be the cost of maintenance? What will be the deprecation – what will the end asset be worth? What effect will competition have on the business case? What will provide a simpler regulatory environment? What will be best suited to meet future needs? What will be the most cost effective to upgrade when necessary? What will provide the most ubiquitous solution? What does Australia actually want? For the record, we are also looking into religion. We are totally open to believing in any religion equally. We will accept Atheism, Christianity, Judaism, Buddhism, Hinduism or anything else. However the belief system we will choose must have a creation story that lasts for 6 days, with an extra day of rest. There must also be a messiah had 12 disciples and who died on a cross for our sins before being resurrected 3 days later. We also need to have a church hierarchy that has a leader with the title of ‘pope’. We will do a thorough and rigorous review of the available belief systems, and we will be totally open to any belief systems so long as they meet our strict criteria. How much fairer and impartial can we be? Why is 25 Mbps the minimum though? Thats a “just in time” mentality, and forces the rollout to continue to play catchup, and cost both the Government and the end consumer more and more over time. Right now they should be working towards 100 Mbps as a minimum, for the simple reason that 100 Mbps will be well in the range of what people want by the time the network is needed, or at worst, in the ensuing 10 year period. They need to be building to needs of the future, not needs of now, and FttN falls down on that aspect. 10 years ago was when FttN needed to be built, not now. I thought I made it clear. We will not be asking what will be best for future needs and we won’t be asking about what is going to be the most cost effective to upgrade. If you insist on expanding the parameters, then I can’t keep my guarantee of being agnostic about the technology that we will be using. You zealot. Your uncertain that god doesn’t exist?? Actually its sort of the opposite. I think theres something, but its not as simple as God and Devil. Seen enough wierd stuff for it all to be coincidence, going back as far as I can remember. Not at all. People just don’t understand. I went hunting on the weekend. I saw rabbits, foxes, hares, wild pigs, kangaroos. I was totally agnostic about which animals ended up getting killed. There was no ideology there at all. I picked up the rifle and aimed it only at the rabbits. I squeezed the trigger only when the rifle was pointed at rabbits.The bullet travelled only towards the rabbits. It only killed rabbits. I did not point the rifle at anything else that could potentially have had rifles pointed at them. Like I said, I was agnostic about what I killed. Just because my choices lead to a foregone conclusion and my actions made that abundantly clear, I can say the word ‘agnostic’ and then you will see that I was actually totally honest and open about the hunting process. Just because I have been telling everyone for months about how much I was looking forward to hunting rabbits, and just because I bought all of the ingredients for a nice rabbit stew, you can’t say that I was actually hunting rabbits. Agnosticism is great. You should try it you zealot. At least someone’s paying attention – you’d think Turnbull had waved a magic wand and everyone had forgotten his duplicitous, dishonest behaviour over the last six years. Because he managed to seem reasonable, using reasonable words that sounded rational and just so downright reasonable, how could you fault the man? Surely he’s been leaning towards a ubiquitous FTTP solution this whole time, he just wants us to get it faster, without all that terrible ALP waste. He only crowed about FTTN to appear fundamentally differentiated from Labor – now the election’s over he can show his true spots: the review will show how to get FTTP faster and cheaper, which is better for all of us. How clever. How thoughtful. You can’t fault reasonable logic like that. 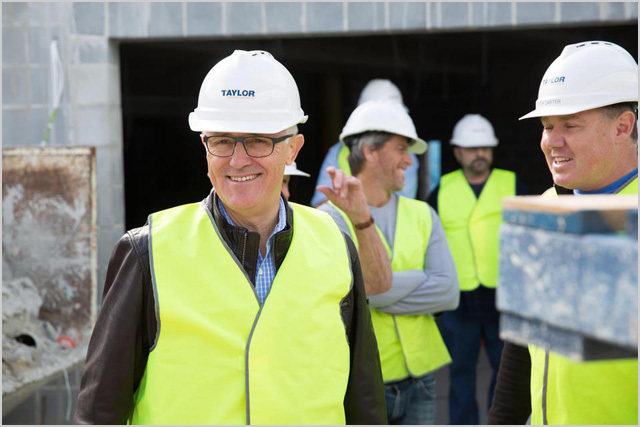 Just wait, I trust him, you’ll see – he’s just such a reasonable, clever politician, that Malcom Turnbull. Except history has shown every time MT makes a speech that sounds reasonable, it is misdirection and distraction, designed to defuse the angry mob and disperse their numbers, making it more difficult to mobilise opposition while everyone’s guard is down. Make no mistake, every day counts for the LNP to come anywhere close to meeting their targets. Telstra were out of the starting gate with their first FTTN demonstration within days of the election, before LNP ministers had even been sworn in. If you think MT is waiting 60+ days for a review that is going to magically change his direction away from the clear and obvious end game (changes to infrastructure competition restrictions while sabotaging Telstra’s only real competitor, FTTP) you have failed to remember that there’s no such thing as magic, you have forgotten the lessons of recent history and Mr Turnbull’s pathological inability to be reasonable. Remember the way he bullied journalists who asked him difficult questions? Remember the speech he gave about honesty and integrity in politics before demonstrating precisely the opposite behaviour pretty much every time he opened his mouth or published something in public? This man is not reasonable, he does not accept criticism or alternative points of view, and if you think people can change that much you are gullible idiots.